I’m really happy we’ve got Alps in Europe. I like those mountains a lot. And I’m proud of Europeans that they came up with building via ferrata . Or maybe not? Well, to be honest, the very first idea of those trails wasn’t very estimable – via ferratas were built during WW1 in Dolomites for soldiers to make their march easier. Now, fortunately, these trails serve only for tourist reasons. Via ferrata in Italian means “iron path”. What's worth remembering is that if you speak about via ferrata to someone in Austria or Germany (even to a lady in tourist information) they’ll look surprised and won’t know what to say. It's because in Austria and Germany such trail's called klettersteig. Simply as that. Ordnung muss sein. 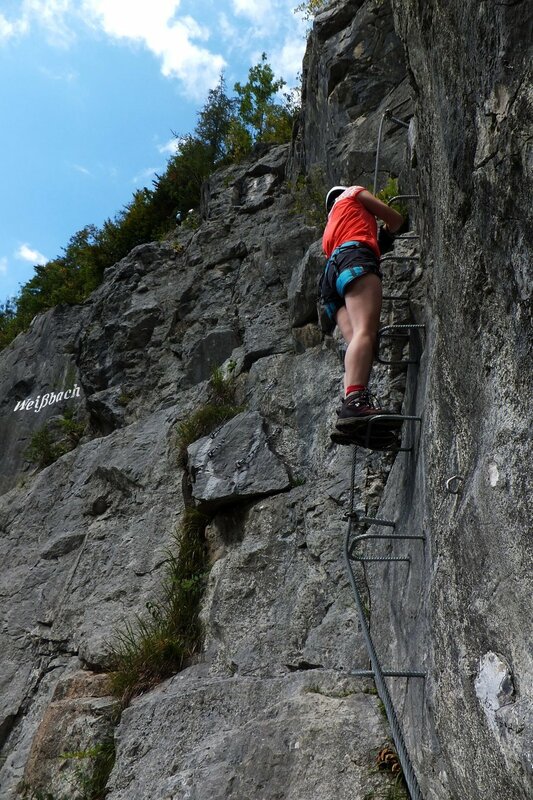 Via ferrata is a mountain trail equipped with safety elements such as iron cable, ladders, pegs, steps and bridges. In order to hike on such a trail you need to have equipment : climbing harness, lunge with 2 carabiners and helmet. I highly recommend to wear gloves as well. The equipment's inexpensive and can be bought in every sports shop. At the beginning of a trail you need to attach and lock both carabiners on the cable. Each time you reach a place where the cable is fixed to the rock you'll need to individually unclip and re-clip your carabiners beyond the attachment point. This must always be done one at a time, ensuring that you constantly keep at least one carabiner attached to the cable . These trails differ in difficulty. The scale is different in each country. For instance, in Italy the rating system consists of numbers which indicate technical difficulty (1 being the easiest and 5 the most difficult one) and letters which suggest how remote the trail is (A means close to civilization and C indicates the trail's high in the mountains). In Austria they’ve got single-letter system ranging from A (the easiest) to G (the most difficult). Weißbach is great place for via ferrata afficionados – the trails start in the valley so you don’t need to hike with heavy equipment. Besides, there are 3 trails located close to each other so if you’re fit and determined you can hike all of them during one day. The trails are called: Weiße Gams (D), Zahme Gams (B/C) and Wilde Gams (E/F). Unfortunately, it turned out that D level on Weiße Gams is too difficult for us – the beginning of the trail was nice and easy but later on it got difficult and good climbing skills were required. In this case we didn’t even think about trying Wilde Gams (E/F) and went straight to Zahme Gams (B/C). This one turned out to be a great success – it was pleasantly thrilling and made us positively excited. The second via ferrata which we climbed was trail on Hochkranz (1953 metres). We started hiking from Pürzlbach parking (1060 metres). Getting to via ferrata took us about 2 and a half hour. The weather that day wasn’t so great – it was windy and misty and we were rather concerned about hiking via ferrata in such weather. But all ended well. The trail turned out to be nice and easy and finishing it took us about half an hour. After having a break on the peak we decided to climb down the same way we used to ascend. I'd not advise to do so because via ferratas are one-way . We climbed it down because there were no people besides us on the trail and we wanted to get directly to our car. I hope my excuse is sufficient 😉 . Besides via ferratas mentioned above, we hiked many trails equipped with ladders and chains which aren’t officially called via ferrata. One of especially interesting one is path leading to Buchweißbach waterfall in Saalfelden. An innocent gravel road in the gorge changed suddenly into narrow slippery path full of slimy rocks, ladders and chains. To sum up, anyone who can hike and isn’t afraid of height can try via ferrata – no special climbing experience is required. These trails will make your heart beat faster and give you awesome feeling of complacency after reaching the end. However, caution and proper equipment are indispensable on such trails. Have you ever hiked via ferrata trails?